Did you grow up country? Can you picture a Dad, brother, or uncle toiling under the torrid July sun in the wheat field? If so, you know that farmers always wore hats with brims. The ruddy-faced farmers I knew in the fifties probably didn’t use Coppertone or any other sunscreen, but they always wore hats with bills, revealing a totally white forehead when the caps came off. 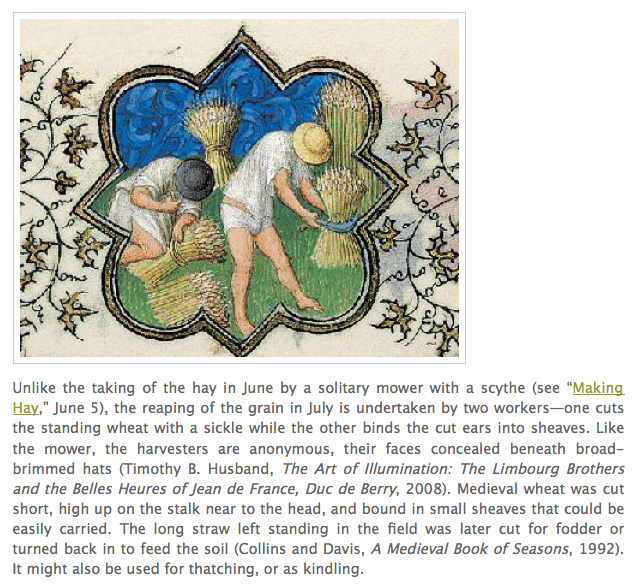 The medieval French farmers in the drawing below in what looks like undies and sandals shield their anonymous faces from the sun with straw hats. My dad farmed land in Lancaster County, Pennsylvania, so he was a farmer too, but he was known first as a farm implement dealer. As the owner of Longenecker Farm Supply, he sold farmers tractors, bailers, or combines for grain harvesting, and they called him often in a panic when their equipment broke down: In the middle of the field. At the worst possible time. When storm clouds loomed. Howard Longenencker, one of Dad’s cousins, and Best Man at Mom and Dad’s wedding, is pictured here in a movie clip taking his new Minneapolis Moline harvesting machinery for a whirl around the field, enjoying every minute. Watch for his jubilant wave! I’ll call the clip “Grainy Amber” because it was filmed in the 1950s with much less sophisticated technology than available now. Another relative, Esther Mae Longenecker Hiestand, has captured images of her family’s grain harvest in her 489-page book, all about the Longeneckers descended from the line of Ulrich Longenecker, who emigrated from Switzerland to America. She and her family collected over a dozen images of hay and wheat harvesting in her portrait of a Lancaster County family entitled Pitchforks and Pitchpipes (454 – 457). Did you grow up country? Share your experience with summer harvesting of all kinds. Or add an impression, a quote. Whatever! Oh yes, Marian! My dad purchased a combine, I think. I know he had a corn picker. Maybe he bought it from your father. Loved the video. I could picture my own father. He would have merely tipped his Eby Feeds cap just long enough to reveal the white forehead. Please post on the FB group page “I Grew Up Country.” A perfect contribution. You’re an early bird – and country lover, just like many who comment here. When “the world is too much with us” we can turn our necks and look back into the land of nostalgia for golden moments like these. Thanks, Shirley. Another great post, Marian! I love your dad’s cousin waving his hat from his machine! My parents grew up in the city, and I grew up in suburban areas. Have you read “Some Luck” by Jane Smiley? There are lots of descriptions about farming and changes over several decades. I’ve not read this book by Jane Smiley, but I have read A Thousand Acres, even wrote a paper on it, “A Thousand Acres, Not King Lear in a Corn Field.” I believe I also saw an article about her in the latest issue of Writer’s Digest. The title you suggest sounds like the perfect companion on my next trip to the country. Thanks, Merril. I really liked it, Marian. It’s the first book of a trilogy, I believe. I think you’ll like it. I grew up country as you say. I love those amber waves of grain. Your clip reminded me of growing up on a prairie farm in Southern Alberta. My dad would have tipped his cowboy hat to any one passing by. He had the typical farmer´s tan with the white forehead. Many a time he had to call the local farm implement dealer to do an emergency repair. One time, the owner gave me my very own toy John Deer combine. Blessings to all those wonderful farm implement dealers and the farmers of the world. Thanks for giving us a Canadian version of this Pennsylvania story. If time and place were not a consideration, I can imagine my dad fixing your dad’s broken down equipment if necessary. My dad also had toy tractors, gold not green though. John Deere was considered a tough competitor. So nice to hear from the farm girl, now a writer in Spain. That’s you, Darlene. My dad owned International Harvester and Massey Ferguson equipment as well. I believe the IH stuff was gold coloured. I had a gold IH toy truck, an exact replica of my dads. I know our dads would have enjoyed each other´s company! I’m glad this post brought back tasty memories of warm milk – touch too since you mention even milking the cows. I believe the English painter John Constable used to paint country scenes with cows and clouds. Anyway, that’s what popped into my mind as I read your comment. Thanks always for reading and commenting here, Carol. Here’s to another one of your fabulous, informative posts, Marian. I grew up in the country as a home builders daughter, carrying lumber, stacking bricks and sweeping up nails. That’s the thing about the blog world, we learn new things about the personal lives of our friends. Who knew you learned about the construction life as a girl. I can smell the sweat, remember the basin and soap my mother put out on a stand for the men to wash the worst of the grime, the excitement of helping host the men for a big summer “thresher” dinner (but which my mother dreaded). I liked it because I was tapped to help with the cooking; my next oldest sister was usually somewhere out in the fields with whatever job my dad assigned. My 4-year younger brother was likely playing in the house and oldest sister was off at a part time job or something. Thanks for these good memories. Melodie, you paint a picture sort of like an Our Town in the country, everyone playing their appointed roles so the whole machine works without a hitch. Oh, your experience with cooking goes way back to threshing days. I wonder whether your mother dreaded cooking in general or just the vast amounts of food required for the grain harvesters. Aside from biscuits and cornbread, we only had potatoes. I’ve seen grain growing from afar. Lots of tractors were involved in our farming though. Did I know you grew up on a farm? Georgia maybe? Marian — You never cease to amaze me with the photos and video clips that you have! I love how a blog post on a simple topic can tease out amazing details in the lives of reader/writer/friends here. Have you ever written about that grandfather Henning? Quite a story there. My paternal grandfather was named Henry Risser Longenecker, but friends and adult relatives usually referred to him as Hen or Henner. Ha! Titled “Fourteen Christmases,” my current memoir manuscript covers a small window of time that doesn’t include when he was still living. However, when I go back and “fill in the blanks,” you can be sure that Grandpa Henning will figure largely. Not common at all, how cool to know that your paternal grandpa was known as Hen or Henner! I notice your phrases; “My current memoir manuscript” and “fill in the blanks!” Why, Laurie, you must be working on a memoir, “compadres” yet again. Thanks always for filling in the blanks here. I grew up in the country, on my mother’s family farm property, but both my parents were teachers. My father was strictly from the city, but he learned. I always liked helping with cooking. Cleanup before eating was done at the big back entry sink (kind of like a double laundry tub) with Lava soap. The same place where we clean vegetables etc to keep dirt out of the kitchen. One of my great-uncles had the farm implement dealership. You have all the bases covered here, Athanasia. Growing up country, washing up with Lava soap before meals, and a great uncle with a farm implement business like my dad. I don’t do the Facebook. Thanks, anyways. Have you read the book LITTLE HEATHENS by Mildred Armstrong Kalish? It takes place before my time, more in my parent’s time. The book was going around our Homemakers group this past winter and spring. Sorry my response is so delayed. Time is flying, especially now. The corn is abundant. among other things. Kathryn Lee Bates first wrote this from Pikes Peak, Marian, and since we live at the base of Pikes Peak we know exactly what she loved about the views. Jim’s family–he’s 3rd generation Coloradan–worked the land in northern Colorado on their farms, so he knows it from both perspectives. We appreciate it all and never take any of it for granted…especially after the fires two years ago that destroyed hundreds of acres and so many homes. Oh, my goodness, Marylin, lucky you! 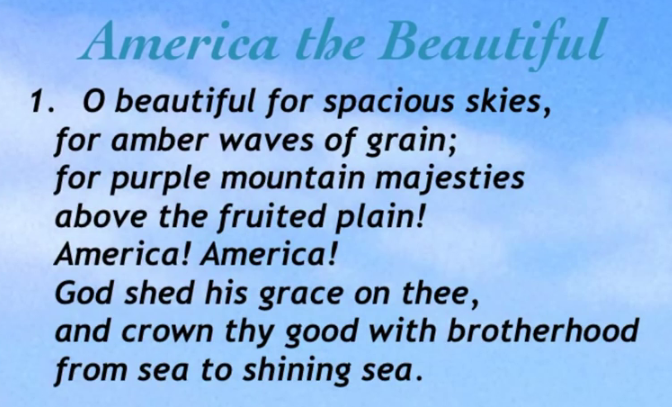 Thanks for calling attention to the words of this beautiful anthem. You are the first to mention it. I wonder whether we have seen this view on any of your blog posts. Thanks for adding a mid-westerner’s perspective to the conversation here. I love today’s post it’s like a joyful mini history lesson. I knew nothing of farming Marion , till I came to live here in West Wales . The first 7 months here we rented a cottage on a sheep farm , maybe you remember , and I could see first hand how hard , yet rewarding farming can be. Now here in our half house we a surrounded by fields of wheat, hay , corn , sheep and cows. This busy , busy world just flows on around us . All we have to do is go to the supermarket …we are blessed . You painted a beautiful picture of your bucolic landscape, Cherry. And you don’t have to lift a finger to enjoy it – ha! I can picture the golden grains and the blue sky. Your pictures speak for themselves – and louder than words! Thanks again for the photo collage in blue and gold today. I grew up in corn country. My grandfather planted/harvested mostly field corn, which we shucked and let dry on the cob in a corn crib. I was too young to know what it was for–pig fodder, I think. We didn’t eat it. Maybe he sold some of it? Theirs was a small farm–30 acres I think, and both of them had jobs off the farm to help support it. My favorite harvest was the apple harvest, when we’d make sauce and pies. It’s easy to understand why the apple harvest stands out in your mind, gourmet cook that you are. Rather than worrying about feeding pigs or cattle, you concentrated then and now on what you loved best: cooking. Thanks for the feast for the eyes we often see on your blog posts and Facebook pages too, Tracy. I’m a city girl but my heart is country. My time on anchor rd. I got to see so many families on their farms enjoying great food made from scratch. Learned some much of family values. We live in wheaton and we have a 20×40 plot where ny husband plants our summer vegetables tomatoes cabbages spinach collard green green peppers red peppers jalapeños cucumbers asparagus and zucchini. Who would have thought that God would have blessed me with a great man who loves to plant and harvest a only cook and eat lol. He too wears a straw hat to mow the lawn which is a lot and to tend our garden. Thank you for the great video and picture. According to this description, you hit the jackpot in many ways, Gloria.It is so gratifying to read your happy comments coming from a grateful heart. I’m glad you enjoyed the video. Howard Longenecker went to Bossler’s Mennonite Church, so you probably met him and his wife, Pearl, who is still living. I didn’t grow up country, but I did MOW our grass in Spokane when I was young…and the grass clippings turned yellow. Does that count? On a better note, I did marry a country girl…named Marian. Yours sounds a lot like my life growing up: acreage but no farm animals. Grandma had a strawberry patch, but the blackberries came from bushes growing wild near a Revolutionary War cemetery in the woods above her house. Our strawberries and blackberries also came from the wild. They were good. Our land was right next to state land which drew hunters. That part I wasn’t crazy about. So does that mean you always had to wear bright orange in the fall – hehe! I remember summer harvest when I lived in Missouri. My grandparents had a farm, but they were down to a herd of sheep, one cow, a dozen chickens, and a few pigs when I was a kid. Even though my dad was no longer on the farm, the harvest and lack of rain were the topics of conversation when my dad and I joined other businessmen at the Jefferson Hotel for morning coffee (milk for me) break. If the harvest was poor, every business in town suffered. We all kept our eye on the weather and the fields of grain. When you think about it, farming is a big gamble. Without weather cooperating, farmers fumble and fail. I remember conversations beginning with words like “Oh, I hope we get rain soon” and the happiness or disappointment about what happened (or didn’t happen next). My father’s business was totally dependent on the fortunes of farmers. I can well relate to the predicament you describe here, Elaine. Debby, you are the first to comment on the singing children. I love their innocence and candor too. “Singing this song might be a good time to yawn,” one of them seems to say” – lol!